Following the popular post about how to get a great guitar tone from amp sims I’d now like to adress the challenge of bass. Like me, a lot of home studio owners/bedroom guitarists don’t even own a physical, electric bass. Well, just like with drums, you can solve that using a virtual bass plugin in your DAW. If you do have an electric bass, the tips here probably apply anyway as I’ve gotten them from the magnificent Systematic Mixing Guide e-book. A DAW (a musical production application) like Reaper, Cubase, Logic, Protools etc. 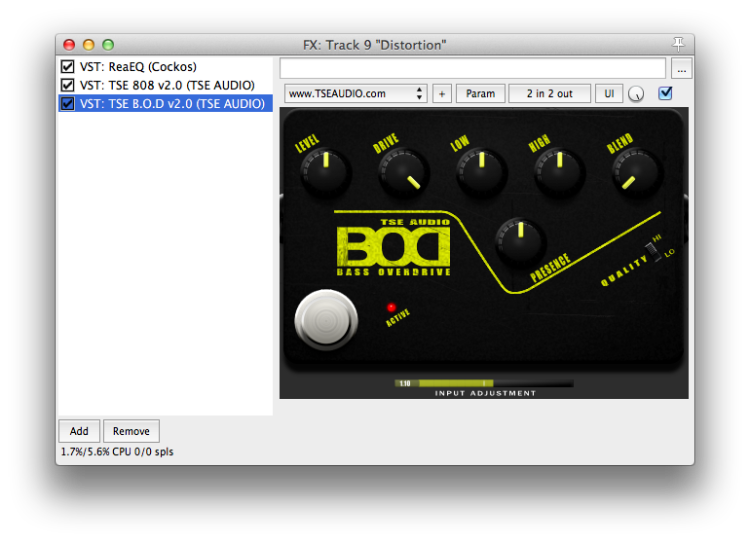 A virtual bass amp plugin like B.O.D 2.0 by The Serina Experiment. (Optional) A TubeScreamer sim like the TS808 by TSE. An electric bass plugin like one of those I blogged about earlier. 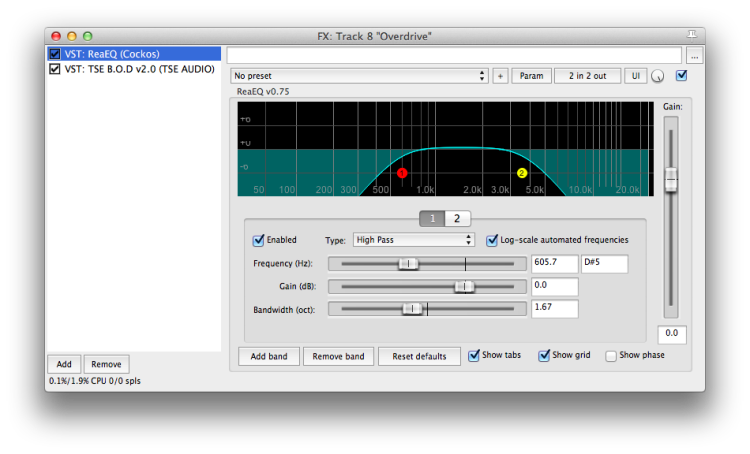 For this post I used an even simpler one with no settings at all (that sounds better than VB-1): 4front bass. To get a great metal bass tone (it’s always metal with me, I think you know that by now :-) ) you need to apply distortion. In metal, the bass is supposed to act like a third, tuned-down guitar, that glues the regular guitars together while at the same time providing bottom and rhythmic stability. A regular bass guitar just plugged into an amp will be great for 70s disco music, but it won’t glue with distorted guitars. In the documentary about Lemmy there’s a great clip where he shows the difference, just cranking up the gain on his amp. However, for production use, just applying distortion to a bass track will muddy it up and it will mess with the distorted guitars. The trick is to separate the track into three separate, parallel tracks that will handle different parts of the bass’s frequency spectrum and create a blended tone. The bottom track is left as it is, you want the bottom to really be felt without trashing it to pieces with distortion. One of the two other tracks are slightly distorted two provide some grit in the mids and the other one is more distorted to get that nice glueing effect with the guitars. I’m going to show how I do it in Reaper, just adapt it to the concept and workflows in your DAW if you are using something else. This track holds the actual MIDI patterns for the bass. I’ve chosen to put this in a sub track below the track with the actual bass plugin. The reason is to be able to easily add more MIDI tracks to test different note/riff variations without having to mess around with takes on one single track. This track has no plugins. IO is default: sends to parent/master (i.e. to the Bass Plugin track). This track is the parent of the Bass MIDI track and receives all of its signal. 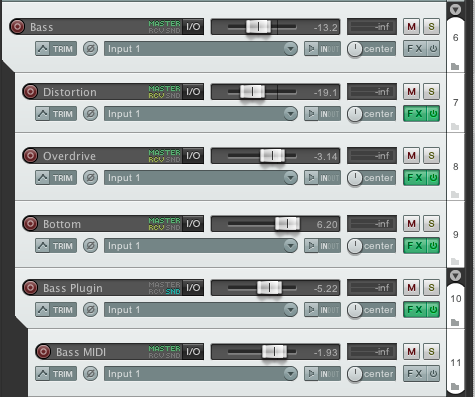 It has just one plugin, the electric bass plugin. For this post I used the very simple 4front bass. You can use any electric bass VST. Sometime down the line I’ll probably buy Trillian, but until then I get along with cheap/free alternatives. This track does not send to parent/master. 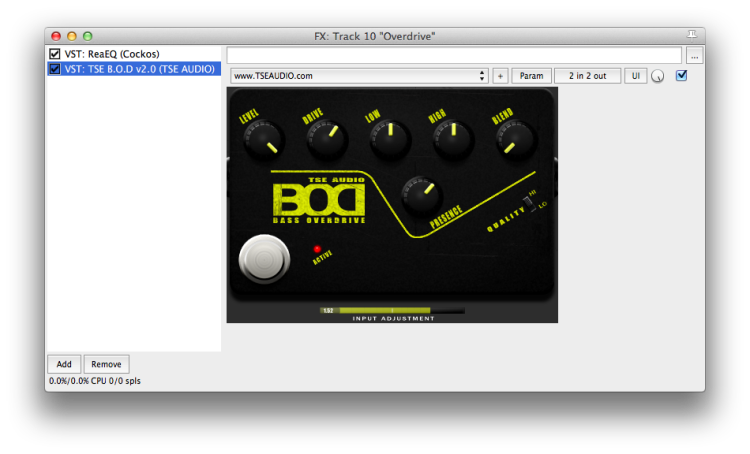 Instead it sends to the three tracks above it: bottom, overdrive and distortion (see below). 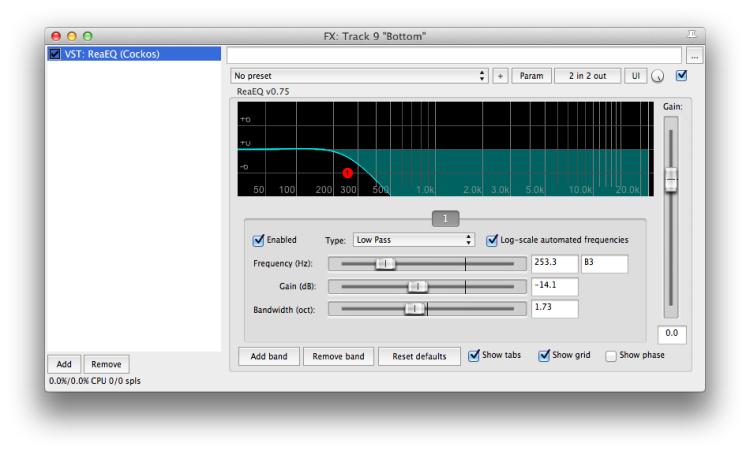 This is the root track that collects the three parallel bass tracks into a blended tone. It can be used to control the overall bass volume in the mix. Default sends (to master/parent). This is an applied use of the theory and tips in the bass chapter in the Systematic Mixing Guide. Get it, you won’t be disappointed.